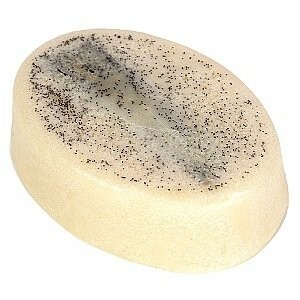 Be possessed by the Pod People Vanilla Massage Bar. With real Vanilla Pod, Honey and Patchouli essential oil, this sensual moreish pure butter massage bar with scent you to heaven. Hold the bar gently between the palms of your hands and it will melt slightly. Use the oil on your fingers to gently massage and moisturise your skin. Theobroma Cacao (Cocoa) Seed Butter, Copernicia Cerifera (Carnauba) Wax, Parfum (Fragrance), Vanilla Planifiolia (Vanilla) Fruit, Pogostemon Cablin (Patchouli) Oil, Helianthus Annus (Sunflower) Seed Oil, Vanilla Planifolia (Vanilla) Fruit Extract, Tocopherol, Benzyl Salicylate, Citronellol, Coumarin, Eugenol, Hexy Cinnamal, Butylphenyl Methylpropional, Limonene, Linalool, Hydroxyisohexyl 3-cyclohexene Carboxaldehyde, a-Isomethyl Ionone. Scent is so sweet and delicious, absorbs really well and covers skin well. Melted really well and gave just the desired amount. Scent is absolutely delicious, so warm and soothing, I felt like I would too melt. Just had the right amount to massage into skin and the bar lasts quite a bit too. Skin felt so good after and I actually felt so relaxed too. It is just so heavenly. The price is good and the bar looks so nice.